The Frontiers in Medicinal Chemistry symposium is co-organised on a biennial basis, as a collaboration between the ACS (American Chemical Society) and the EFMC (European Federation for Medicinal Chemistry). Frontiers in Medicinal Chemistry 2015 will be jointly organised by EFMC, ACS and the local Dutch and Belgian organisers: the Medicinal and Bioorganic Chemistry Division of the Royal Flemish Chemical Society (KVCV, Belgium), the Société Royale de Chimie (SRC, Belgium), and the Section Medicinal Chemistry of the Royal Netherlands Chemical Society (KNCV, The Netherlands). 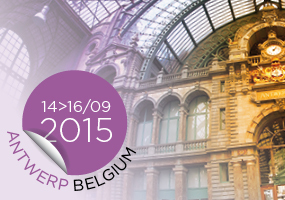 The 2015 edition of the symposium will take place in Antwerp, Belgium, from September 14-16, 2015. This biennial meeting is a key symposium in its field with traditionally around 300 participants, from industry and academia. The Frontiers Meeting attracts a highly targeted audience composed of experts in drug discovery and development, in particular medicinal and synthetic chemists, together with scientists active in the fields of computer assisted drug design, biology, DMPK, pharmacology, early toxicology, as well as chemical and pharmaceutical development. The scientific programme for Frontiers 2015 will feature a plenary session, followed by sessions covering the latest advances in medicinal chemistry. In connection with the FMC Meeting, EFMC will organise the second edition of the EFMC Young Medicinal Chemist Symposium (EFMC-YMCS 2015), which will take place on September 17 in the same location. Due to the connection between the EFMC Young Medicinal Chemist Symposium and FMC Meeting, the participants who are registered to FMC 2015 can benefit from a special rate and a free registration for students.